Yes Biff's Coffee Shop certainly belongs among the classic coffee shops. 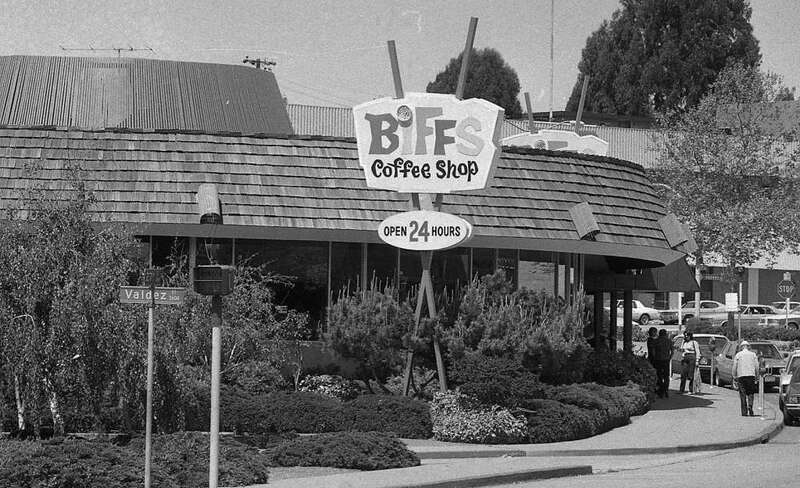 Biff's Coffee Shop opened its doors to the public in 1963 in the coffee shop architecture style featured by Armet & Davis. Biff's recently closed down in 1996. A non-profit group called Save Biff's saved this one from the big coffee shop in the sky. Today an auto dealership occupies the lot but the building still stands. Here's a shot of the Biff's back when it was still open 24 hours as a coffee shp. Check out the googie building and font. The Pancake Circus is a must eat place if you're in or visiting the Sacramento area. The breakfasts are generous, the service is good, and the food is tasty! The building here dates back to 1961 when Al & Bud's Platter opened up. The location became Pancake Circus in 1970. The place is worth a stop not just for its food but to check out the neon lettering. This fun sign for Dave's Coffee Shop points to an eatery that appears to sadly be no more. Check out the dancing chef character on this marquee who appears rather happy at this point in time. According to this contributor to Yelp, Dave's opened its doors in 1930 and closed in 2004. Word is the sign was removed around 2008. Check out this flashback to the times when a neighborhood coffee shop was the place to grab a hot meal. Give It's Tops a try if you're in the Bay Area. The place originally opened in 1935 with a diner atmosphere. While there, grab a bacon & eggs breakfast or burger. For more information, see the It's Tops website. Here's the sign above the restaurant area at Mels Bowl in Redwood City, CA. Looks like the lettering was at the least formerly neon. Mels Bowl first opened in 1960 and over the years around 1969 the name changed to the Redwood Lanes Bowling Center. The founder Mel Weiss also co-founded the well known Mel's Drive-in chain of restaurants. 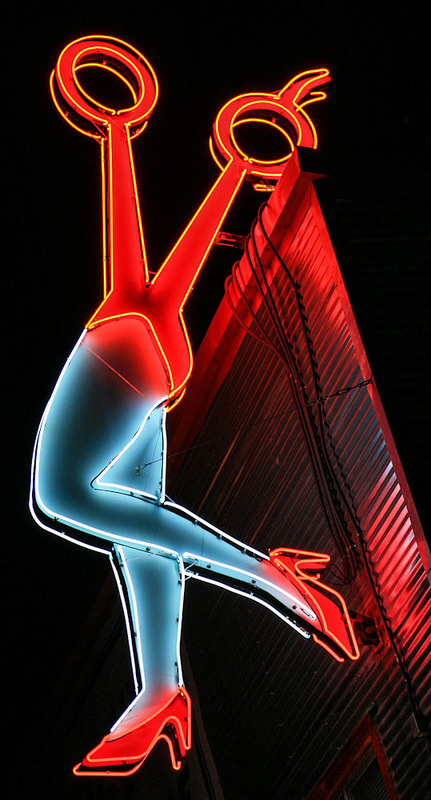 Sneak a peek at this classic old Denny's sign, made long before Denny's followed through on notions to become a diner. This Redwood City location also features a traditional Armet and Davis designed boomerang siding on its restaurant. Luckily, this Denny's doesn't appear to have been "dinerized" yet.